Belize Ecology & National Parks "Our Belize Vacation" - "Our Belize Vacation"
In the mid 1980's, the government recognized that small scale, low impact tourism was the way to provide stable economic growth while still safeguarding the environment. Rather than follow the mass-tourism path of Cancun, 250 miles to the north, Belize decided to follow one that would allow as many Belizeans as possible to participate in the tourism industry as stakeholders. The development of a few natural tours (cave tubing, zip lining, horseback riding, Mayan ruin , baboon sanctuary, Belize Zoo, etc.) all located in the in the spectacular interior of Belize, has provided a foundation for sustainable tourism here in Belize. Tourism is now Belize's number one foreign revenue earner. And strict governmental guidelines, environmental education and enthusiastic co-operation with international conservation organizations such as WWF and The Nature Conservancy, promise a bright future for both Belize's environment and its pioneering eco-tourism. So what can you do to keep your depredations to a minimum? Apply this rule of thumb. 1. TOUCH NOTHING - If you can possibly avoid it. Touching kills coral. Touching unfamiliar plants in the forest could kill you. 2. BUY NOTHING - Unless you are assured by an authority (not the seller) that commerce in the product is legal. 3. EAT NOTHING - That is out of season. Lobster season is July to March. Forget the beast the rest of the year, no matter the temptation. 4. KEEP NOTHING - That you catch from the sea, unless you plan to eat it. 5. LEAVE NOTHING - On the land that wasn't there before you arrived, unless it will decompose. Almost the entire coastline of Belize, including the fringes of its many cayes, are covered by dense stands of black, white, and red mangrove, with the latter species dominating. Different types of mangroves are adapted to varying degrees of alinity, and you will notice them changing as you go away from sources of saltwater. While 90 percent of the world's original mangrove forests have been destroyed, Belize can boast that 90 percent of its mangrove habitat remains intact. The ancient Maya made extensive use of the mangrove wetlands, as evicdenced by the use of crcodile and manatee images in their artwork. Mangroves as tall as 100 feet or more can be seen along some waterways, such as the Toledo District's Temash River within the Temash/Sarstoon National Park. A more accessible protected area in which to visit mangroves is the Burdon Canal Nature Reserve, just west of Belize City, and the Drowned Cayes to the city's east. Although these tangled saltwater thickets have traditionally been despised by settlers, who often cleared them as quickly as possible, they protect shorelines from erosion during storms and provide an irreplaceable nursery for small fish, turtles, and crustaceans. Snorkeling near mangrove roots often is more rewarding, in terms of marine life, than swimming in open water or near coral reefs. Above the waterline, visitors can see egrets, herons, isbises, roseate spoonbills, pelicans, frigate birds, raptors, and bobbies amid the tangled roots and branches. Coatimundis, crocodiles, tapirs, jaguars, raccoons, and boa constrictors are also found in these wetland areas. Marching out to sea, mangrove forests shelter an entire underwater universe. The mangrove ecosystem provides a nutritious food source for the flora and fauna clinging to sturdy prop roots. Abundant green, brown and red algae dominate the scene. The dense undergrowth serves as nursery and haven for small marine life. Once considered a useless swamp of impenetrable trees, mud flats and mosquitoes, the mangal mangrove complex is newly appreciated for what it is: an ancient prolific habitat, teeming with life. The mangal does not readily surrender its secrets. There is danger here. Tangled roots make it difficult to enter the mangal, and dense trees that look alike make it easy to get lost. Tides wash in and out. Bugs bite, snakes and crocodiles lurk. No other trees can complete with mangroves for space under the stressful conditions that exist in the mangal. Mangrove trees have a unique ability to grow in mud that lacks oxygen and to survive salt water tidal immersion. Aerial roots, sprouting up, down, and out, assist in gas excahange during flooding. 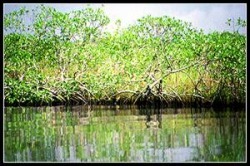 Red mangrove roots take in sea water and convert it to fresh water for the tree through reverse osmosis. Black mangroves expe salt water through stomata, minute openings on the surface of the leaf, where the water evaporates and the salt crystallizes. 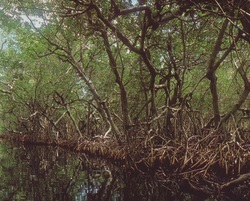 White mangroves grow closer inshore and have the least salt water intrusion. Mangals fringe the land by the sea in warm regions worldwide, usually where offshore coral reefs exists. The mangal is one of Earth's richest and most diversified marine environments. Birds roost and nest in the upper canopy of the trees, crabs and snails climb the roots and branches. Land mammals, such as raccoons, mice, rats, and bats find a welcome source of nutritious food. Midges bite, and mosquitoes thrive in the stultifying heat and humidity. They can descend in such numbers they cloud the sun. The underwater mangrove zone is nursery to countless numbers of fishes and invertebrates. All find haven from predators and shelter from storms. All feed on and add to the rich soup of the submerged food web. When natural shoals from near shorelines and islands, mangrove seedlings and prop roots can colonize them, expanding the mangal. Mangroves may also protect shorelines from the stress of tidal erosion and heavy waves during tropical storms and hurricanes. Our focus is the Red Mangrove, the most abundant tree in the mangal. It is also the most distinctive, easily recognized by its stilt-like, spinery propr roots, which spread wildly outward from the trunk. Aerial roots reach down from the branches to provide additional anchorage. The Red Mangrove is found on Atlantic and Caribbean coastlines from Florida to Brazil, and on Pacific coastlines from Mexico to Central and South America.